So here's the deal! I was way too busy giving lots of cuddles and loves to Grayson yesterday to prepare todays fitness friday. Also since I have to head to work super early I don't have time to write anything amazingly helpful this week!! epic.fail. But here are some motivational quotes to think about every time you are thinking, "oh it won't make a difference today, I'll do it tomorrow, I already ate something"naughty" so I'll try again tomorrow." You know all of those thoughts that set us back! I seriously love all of these! But I really really like the "strive for progress, not perfection" Being skinny doesn't mean anything! It is all about being fit and healthy! 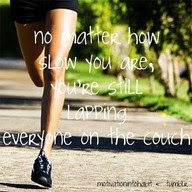 There is no such thing as perfect, so if you run 10 more minutes than last time..thats progress! 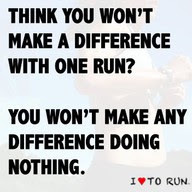 I also love the "think you won't make a difference with one run?" I always think this one to myself when I am feeling like slacking on my work outs, or eating something "naughty". 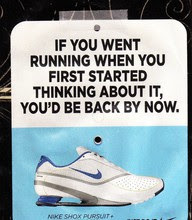 It is easy to think "oh it won't make a difference if I miss one work out!" But guess what! It WILL make a difference if you DO that work out! Love these motivational statements .. they really do help! Happy Friday. Hope you have had a lovely weekend!! Oh man, I totally needed to read these!! Maybe I'll go for a walk after work. :) Have a good weekend! it is an important one to remember!! All of those quotes are AMAZING. amen to "I'll start tomorrow"... I'm infamous for that!! On the good note, starting tomorrow morning off right with a bootcamp work out in the am :) Happy weekend girlie!! Bootcamp is killer! I hope it went well and that you had a fantastic weekend! new to your blog! i'm excited to follow! So excited to have you!